The EUR/USD is on the back foot after the Federal Reserve remained optimistic about the economy. Earlier, the greenback recovered from the initial drop resulting from the Mid-Terms. The Technical Confluences Indicator shows that the pair has some weak support 1.1341 where we see the confluence of the Fibonacci 23.6% one-week, the Bollinger Band 15m-Lower, the Simple Moving Average 5-15m, and the Bolinger Band 1h-Lower. 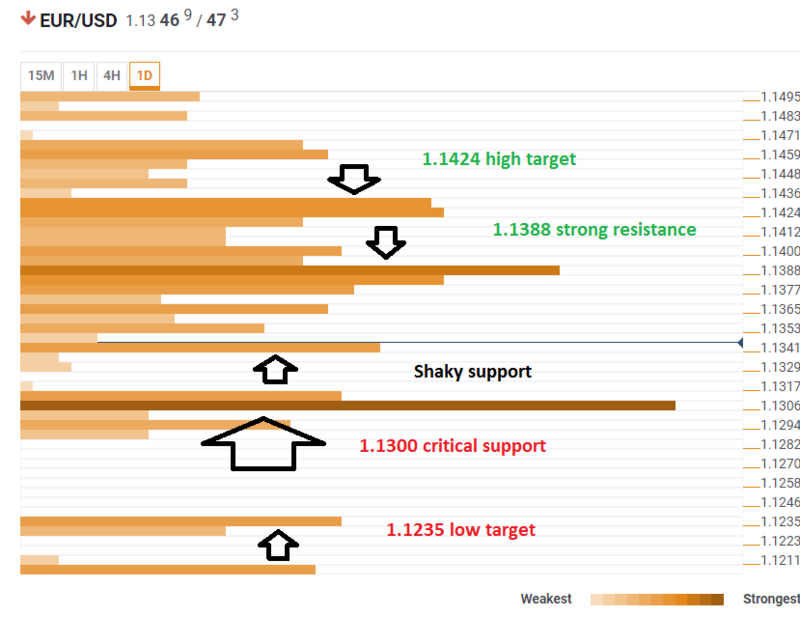 The next support line is a crucial one: 1.1300 is not only a round number but also the convergence of the Pivot Point one-month Support 1, last week's low, last month's low, and the Pivot Point one-day Support 2. If the pair loses 1.1300, the next level to watch is 1.1235 which is the meeting point of two Pivot Points: the one-week S3, and the one-week Support 2. A recovery will send the EUR/USD to resistance at 1.1388 which is a dense cluster including the SMA 10-one-day, the Fibonacci 38.2% one-day, the Fibonacci 23.6% one-month, the SMA 5-4h, the Fibonacci 23.6% one-day, the SMA 200-1h, and the SMA 50-4h. 1.1424 is where the PP 1-day, R1, the BB 4h-Middle, the Fibonacci 38.2% one-month, the SMA 50-1h, and the SMA 200-15m.